In 2016 Theresa May named modern slavery as the greatest human rights issue of our time. She said that “these crimes must be stopped and the victims of modern slavery must go free”. The Modern Slavery Act was the Prime Minister’s initiative to combat modern slavery and to be a global leader in the fight against it. However, this report shows that the UK’s systems are far behind other models in both the US and Europe. The Modern Slavery Act 2015 (MSA) focused primarily on law enforcement and increasing prosecutions. Yet the National Audit Office review of the MSA at the end of 2017 showed that there has been little increase in the number of prosecutions or convictions of these offences. The Act failed to address the role of the victim as the main witness to any criminal investigation, and the support needed to ensure that a victim could engage with the process. Three years on the regulations and guidance that the government should have prepared in relation to victim support has not been drafted. The research, carried out by Nusrat Uddin at Wilson Solicitors LLP and funded by the Winston Churchill Memorial Fellowship Trust, puts the focus back onto the victim and their vulnerabilities. The report highlights the support required to ensure that victims are able to engage in the long and arduous process of the criminal prosecution of their traffickers. There needs to be systems in place to protect and enforce victim’s right throughout process and beyond. The US has the availability of long-term support workers who provide extensive emotional support, legal assistance and long-term status for foreign victims engaging in the prosecution process. All of these factors were shown to help victims to stabilise after their horrific experiences and empower them to engage with the prosecution. Belgium and the Netherlands, both have systems where victims can access long term support. Each system recognises that victims fear coming forward to authorities. However the United Kingdom fails to respond meaningfully to that fear, lacking coherent provisions of long term support. The effects are clear when comparing the numbers of prosecutions and convictions; the UK is lagging far behind. The research also looks at successes from charitable organisations in the UK which do provide victims with long term specialist support, for example Bakhita House which is a safe house. From this one organisation there were 6 convictions secured for trafficking offences in 2017 alone. When comparing that with 2016 where there were only 69 convictions in the whole country, it is clear that long term support is key to ensuring victims’ engagement and successful prosecutions. “We are very pleased to see that the Home Office have now confirmed an independent review considering the implementation of the statutory defence for victims in the criminal justice system. It is crucial that victims are protected from being punished for anything they were forced to do and appropriate access to legal advice is vital. Last year the House of Commons’ Work and Pensions Select Committee recommended that “all confirmed victims of modern slavery be given at least one year’s leave to remain with recourse to benefits and services. The Victim Support Bill, currently in Parliament endorses that recommendation, as do the findings in this research. However this report goes further to recommend longer term options are needed if the Government is truly committed to protecting victims and prosecuting this crime. 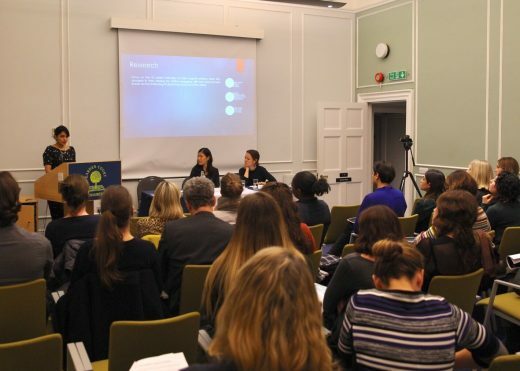 The report was launched at an event earlier this week at Garden Court Chambers, where the Nusrat, Shu Shin Luh from Garden Court and Kate Roberts from Human Trafficking Foundation discussed the findings. A full copy of the report can be found here.